I love statistics but this one sort of scared me. Not like "Boo!" but rather like "what is the deal here?" I completed 715 workouts. That is almost two workouts per day on average. I have logged well over 700 hours of training. That works out to around a 14 hour training week on average. I traveled over 7000 miles during my training. There are lots of sevens there. I guess that is good. I am thankful that I do not have any major pains or injuries with which to contend. Sore calves, feet and hips are acceptable. Three nice runs in the bag this week. A 5K on Monday. A 10K on Tuesday. A 10.5 miler this morning. The calf issue seems to be disappearing. I am still learning. Back to the spin bike this evening. We've been to Flagstaff quite a bit lately. I like the mountains. I especially enjoy escaping the heat. To celebrate my birthday we spent the weekend up there riding bikes and hiking. We rode on Saturday. The weather was great. It can be humid so long as the temperature is below 85. That's exactly what it was. There were lots of people out riding. I rode a 60 mile day with a pretty fast 19.5ish average. Of course it was at altitude and there was a fair amount of climbing. I did not feel 100% strong - but it was still a good effort. Yesterday we hiked a bit of the Kendrick's Peak trail. It was humid and warm. We went up to the first saddle and it looked like there was a storm moving in - so we opted to avoid the lightining strikes. It was probably a wise decision. By the time we left the wilderness area the wind and rain started ... and we were surrounded by lightining. Good call! So there it is. I am 39 and I am good with that. I've had lots of support and love that I might not 100% deserve. Onward and upward. Lots of cycle time coming up over the next few weeks to prepare for the 157 mile Cochise County Cycling Classic. So the case is mostly based on hearsay coming from competitors that finished behind Lance in several races over their careers, right? I am no attorney and would not pretend to be... but even the language in the press release seems to lack "hard" evidence. No offense - but who gives a crap what the other competitors say -- without evidence. d self improvement. I suspect Lance is no different - save the fact that he's a supremely gifted person with drive to boot. If the USADA has proof... then show us the proof. I will vote for science over "testimony". Is this Salem and is Lance a witch? The USADA is robbing the world of watching a guy do what he does while having fun doing it. As far as the divas in triathlon / cycling - if Lance shows up - whips our butts at a race with a shark-like swim, a crushing bike split and a fantastic run I say good for him - if he passes what has now become his MANDATORY drug screens. Great! I got to be there and race with a guy that is one of the best endurance athletes ever. 100% pure, unadulterated "new world" bull crap. If you aren't looking at this situation with some distrust of "the machine" then you aren't paying attention. The real truth is that the people outside this situation don't even know the REAL story. Including me. So yeah - I am a year older than I was on Wednesday. The thing is I feel younger than I did 10 years ago. Fitness. I started out the week with a three workout day. I did a 6 mile trail run on Monday morning. I then ran the stairmaster at lunch for a 5K. That was quite sweaty. Later that evening we went for a stroll around the neighborhood. I did spin class on both Tuesday and Wednesday. We lifted weights and did Yoga too. I also did an uphill run on the treadmill. I am working through the calf issues. I am trying to strengthen them. It's not an injury - it is weakness. I also need to stretch them out before going to bed. Yesterday we went out for a spin on the canals. We got a break from the heat so it was nice to go cycling after work without roasting. We are headed for the hills again this weekend. Flagstaff. We will cycle on Saturday and hike on Sunday. Cooler weather prevails! The best place for group conversations or messing with your smart phone is in a crowded hallway or on a narrow staircase. I learned this today in multiple locations throughout my day. I have had a busy yet productive work week. I did manage to train a little coming off the half ironman on Sunday. I am usually ready to rock the day after these events. This was not the case after Mountain Man. I can honestly say that the first day I felt even close to recovered was yesterday. Certain courses will take a toll on the whole body I suppose. Still, I would not trade the experience. Good times. The weather in Phoenix has been great for the past couple of days. Clouds and a little rain have been the standard now for over 48 hours. What a blessing. It was becoming unbearable there for a couple of weeks. Tires of all sorts are expensive. I have found that out over the past few weeks. What's on tap next? Fitness. More weight training. More swimming. Probably some form changes for my run to try and address the calf cramping issues. If the weather holds we will probably bike, swim and hike over the weekend. My bike is on the mend. We re-routed some cables in the hope that both shifters will behave a little more accurately. I have a new front derailler. The SRAM Red had about 7,000 miles on it. I guess I will excuse it for wearing out. The spring was shot. Good luck to all my peeps that are racing this weekend. The Pikes Peak marathon is this weekend! Number of salt tablets consumed: Lost count at 15. The course was measured long on all three disciplines. 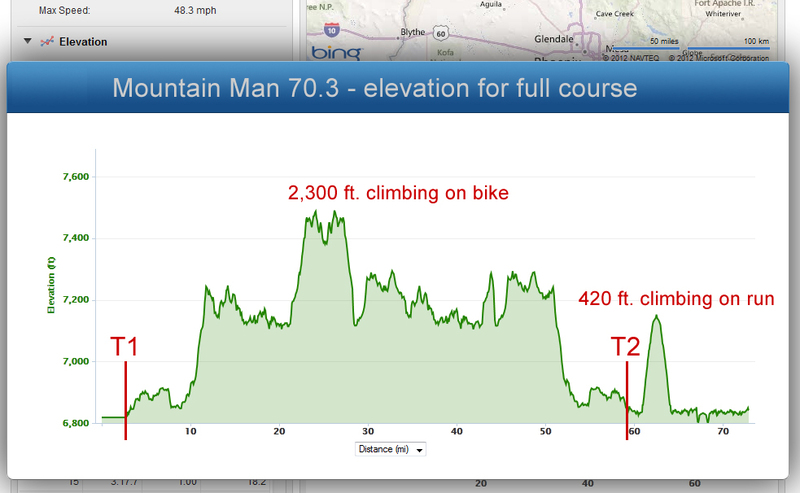 Yesterday's Mountain Man was actually a 72.3. Total Time: 5:50:38 (51 minutes above target time). 52nd out of 123 starters. 5th place in the male 35-39 age group. Bike: 2hr 44 minutes - 57 miles (almost 21mph - even with all the mechanical stuff). Yes it was still fun. Yes I learned some more things about life. Yes this was the hardest race I have done. Yes I underestimated the course and overestimated my target times. I have two 70.3 finishes in as many starts and I can say both of them are sub 6 hour finishes. I am thrilled with that. I've had front derailler issues since my bike blew off the rack at Ironman St. George. I have been trying to avoid anymore outflow on cycling gear. It was a noble effort, but in the end it is clear I should have replaced the derailler. On the way up to Flagstaff I stopped in at the bike shop and had them take one more look at my shifting. It was dropping the chain off the small chain ring on downshifts. We spent 15 or 20 minutes trying to get the shifting to respond and finally we arrived at I could get it to shift correctly if I were on the smallest cog on the rear cassette. I could make it work if I focused on smooth and calm shifting. While climbing the 6000 or so feet up to Flagstaff from Phoenix the tube in my rear tire exploded on the bike. I had let some air out on purpose. I think the bike guy put some back in while he was test riding it. Either way, I am glad I decided to test ride the bike again that evening. The front derailler was completely jacked. It would either drop the chain or not respond at all to the shifter. I took it off and cleaned and greased the spring. I tightened the cable. I adjusted the height. I aligned it perfectly with the drive train. I did everything that my remedial bike skills would allow. On the final test ride I thought I had it. Suddenly the spring released during a shift and the derailler got mangled by the big chain ring. Now it was all bent and wavy from the "toothy" impact of the chain ring. Executive decision time: I am taking it off completely. It is a liability. I can ride the bike course in the big chain ring. I will just have to back off my target time by a few minutes. No big deal. I will make it up on the run. After replacing the tube on the rear and re-packing my race bag I hit the bed. I did a good job of hydrating for this race. Further, I actually got some decent rest prior. I hardly ever sleep before a race. I woke at around 3:30 am on race day. I hammered down two large yams and a small cup of coffee. I loaded my bags and my newly modified Kestrel "10 speed" onto the bike rack. Here goes nothing! What a tremendous race venue. So campy! So original. This is the 28th year for this race. I am proud to be part of the history. The race started early. After getting everything set up and chatting a bit with some pals (Folts x 2, Rink, Leckey, Eaker, Tait, "Colin") there was barely enough time to get to the start line. The swim was long, but I was relaxed throughout and sort of stayed on course. I sighted fairly frequently. I even caught myself having a few moments of good swimming. I stopped once to clear the fog out of my goggles. The only trouble I ran into was coming in to the finish where I had to swim out wide to avoid the giant and unpredictable rocks leading up to the dock. Since I have very tender feet I have to really be cautious. In my other half ironman swim, I swam almost 51 minutes. I came out of the water at 46:08. The other swim was in Tempe at 1000 feet of altitude. The mountain man swim is at 7000 feet. I will take it. I wanted a 42 minute swim, so I was close. I think if I had swam just a little more aggressively I could have gotten the 42. The bike route is fun. We rode most of this course with the Freeloader crew last summer. Seeing Barry and Colin throughout the ride helped me find comedy in my bike's mechanical issues. Barry wondered why I did not blow past him on the downhill coming back into T2 ... He did not know that I had flatted at mile 50 and rode it on a flat the rest of the way in. It was a good thing that I had gotten a new tire. An older tire would not have allowed me to ride 7 miles with very little air. To have a 20+ mph average on this course is a good ride. I held back on purpose to save some for the run. This is a runner's course. I fancy myself as a decent runner nowadays. I have a disadvantage. I have sensitive calves and I weight 186 pounds. The runners that were sub 2 hours on this 13.4 mile course (not a typo) were the smaller guys. I ran a 2:15. I was about 30 minutes slower than I had trained toward. I can't imagine how hard this run would have been if I had not conserved / had issues on the bike. My calf cramps began at mile 8. I still kept pace with what I was running BEFORE the cramps started. I seriously had very little power for the run all day and when the "rolling" cramps began it really became a challenge to keep running. I locked up two times where my legs just stopped working. These calf cramps are strange. They start behind my knee and roll all the way down to my achilles and then back up to the knee. It feels like my legs are being shocked with a cattle prod or an electric fence. Other than the two major lock ups - I "ran" the whole thing. What did I learn at this race? 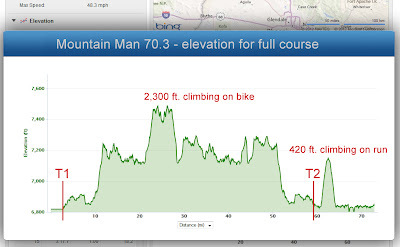 1) Mountain Man 70.3 is a difficult and fun challenge. 2) Elapsed time is becoming much less important to me as the race history piles up. 3) Having this level of fitness and knowledge about my performance is fun. 4) 70.3 and up distance races are almost different sports when compared to the shorter races. This was physically tougher than the day at St. George because my intensity level was up near my "race pace". I was not sore after St. George. I am sore after the Mountain Man 70.3. I like the Olympics both summer and winter. It always impresses me when we get to witness some of the top athletes in the world in their given sport. I am not as drawn to some of the sports as others. Some of the sports I do not really understand. Race walking, for example, is a sport that makes me giggle a bit but also frustrates me. No offense to these folks, but this is not walking. This is a modified run with some wiggly hips and bad tibia angles. Even with the pause button on the streaming video I could pause and catch most of the walkers with both feet off the ground. A half marathon in one hour and 20 minutes is not a "walk". How fast would they be if they ran? I feel like we have not seen the fastest legitimate marathoner because he or she is busy race walking. My race walking rant aside, each of these people had a dream and they have trained many many many hours. Their family and friends have supported and / or hated them during the journey. They have sacrificed a ton to get to where they are and I for one applaud them. Here's another rant. Usain Bolt is fast. We get it. He is a character. We get it. Rodmanesque or not, why does this guy feel the need to showboat so much? Geez man, act like you've been there before. I can't run a 9.6 100 meter dash. If I ran a 11.6 I would be thrilled. I want to believe that if I was the fastest sprinter on the planet I would not feel compelled to A) Proclaim myself a living legend. B) Downtrod others who have reasonably questioned your career trajectory. No one ever doubted your speed Mr. Bolt ... 10.6 is still a fast 100m. What we have a tough time reconciling is the massive decrease in you 100m time in only a few short months. I hope you've done all this talking and winning without doping. I am a Phelps fan. He was built and born to swim. He has worked hard. He's admitted he is not perfect. He says he is done with the Olympics. I hope not because the world enjoys his skill. Well done Michael. Take a break. Do some other things. Then decide if you are done. My prediction. See you in RIO Mr. Phelps. Ashton Eaton and Trey Hardee. If the decathlon included a 400 IM swim, I would declare these two gentlemen some of the better athletes to walk the planet. I don't know which of the 10 events to remove to add the swim ... but that would be a true test. Either way, I do think it is fitting to hang "greatest" on one of these guys (and Bryan Clay too). I have always admired the track & field people. Those gifted people who can jump and run and make it look like they are supposed to be doing it. How about the gymnasts? I like watching gymnastics. I like all of the events. Gabby Douglas peaked at the right time. We will get to see her again in Rio. How about that Netherlands dude on the high bar? "Epke Zonderland of the Netherlands produced a spectacular horizontal high bar routine." That and he has a great name. In my next update I will unleash a wordy, non-sensical and self-centered race report for no one's enjoyment! I wish I owned a restaurant chain so that I could play the role of pundit. I despise politics of any flavor, gender, color, class or creed. I yearn for geniune leadership. I am not a leader and do not desire to be one - thus the reason I never weigh in on most poltical discussions. Do the world a favor and think for yourself, reason through the issues and apply logic where logic is required. Emotion, hearsay, regurgitation, rhetoric and scare tactics should NOT be part of any personal or societal decisioning. Do you ever think about time travel? I like the concept. If you go too far into the details the issues become evident. I am not even thinking about the concepts introduced on Doc Brown's chalkboard in the original Back to the Future. I am talking about more basic stuff - like could you assimilate to the current time IF you had never lived during that era. For example - if I went back to the 1980's I could manage to fit in relatively easy. If I dropped in 50 years into the future or 1000 years into the past I believe it would be extremely difficult to assimilate - even given a longer stretch of time. Yes, we watched a movie. It is called Happy Accidents. It was from 2000. Very interesting plot. Last week was probably one of the more physically taxing weeks I have had training-wise maybe since March. The intensity of the work is getting higher while the duration is actually slightly down. I think I like this plan. I had a great ride on Saturday morning. 57 miles in 2:38 with a controlled heart rate. Also had to deal with red lights and traffic - so I am really pleased with this effort. This is probably the best training ride I have ever had. Then we headed up to Flagstaff for some high altitude and cooler weather. We did a great hike called Sandy Canyon and went up to Fisher Point. Baron the dog was a little tired, so we turned back. Yesterday was chore day along with another great hike. I did something yesterday that I haven't done in a while. I cooked most of my food for the week. This will allow me to focus on the key workouts leading up to next Sunday. This has been a great week of training. I have pushed the intensity to where my body said: "Hey, wait a minute chief ... take some rest." Now I have a day to recover before one more longish ride. Then we will head up to Flagstaff for another weekend of playing in the altitude. Next week I will go back to speed work and take a couple of days off prior to the Mountain Man 70.3.